During breeding season, birds in a flock of white-browed sparrow weavers play different roles. Breeding pairs get assistance from previous offspring, and non-related birds help to defend the breeding territory. They join in the chorus of chirping that warns of approaching predators, with the loudest chirps coming from the breeding pairs. What does the sparrow weaver’s nest look like? It is a woven ball of grasses hanging from a tree limb. White-browed sparrow weavers live in flocks year-round and build several nests in one tree. White-browed sparrow weavers chatter musically in chirps and churrs. When a predator nears the territory of white-browed sparrow weavers, all the birds chirp in chorus in an audible example of their cooperative habits. They search for food in flocks of 20 or more birds. 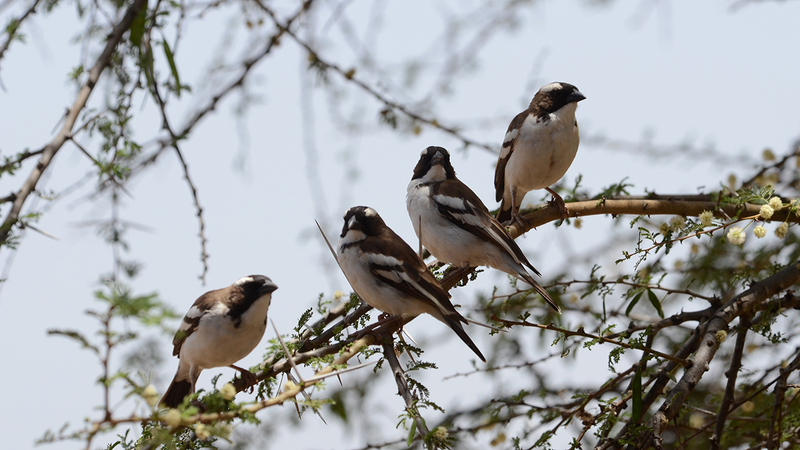 ​Within its ranges in eastern and southern Africa, populations of white-browed sparrow weaver are either common or abundant and are ranked as lower risk by the International Union for Conservation of Nature (IUCN). These sparrow weavers are omnivores that eat insects, especially locusts, termites, and beetles along with seeds and grains. 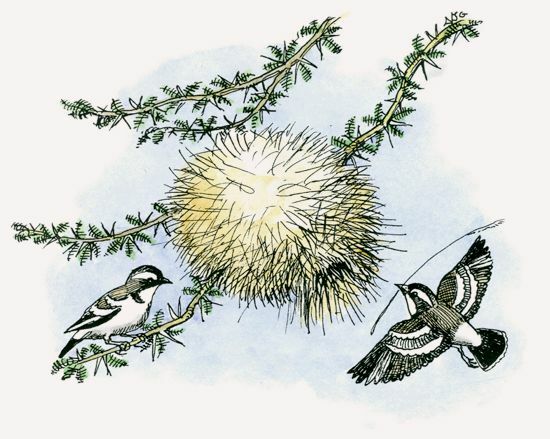 The sparrow weaver’s nest is a woven ball of grasses wedged into branches on the leeward side of a thorny tree. These birds breed as early as August, depending on when the rainy season begins. Although each pair in a group builds a nest, only one pair in that group breeds. The dominant female lays one to three eggs that only she incubates. The newly hatched chicks are fed by their mother for the first few days, then all birds in the group pitch in. The chicks fledge between 21 and 23 days. Other birds, such as red-headed finches, sometimes use the nests of white-browed sparrow weavers. The main predators of sparrow weavers are falcons and kites. Vervet monkeys and snakes raid the nests to eat the eggs and chicks. White-browed sparrow weavers are found throughout Kenya at elevations from 1,300 to 4,600 feet (400 to 1,400 m), except for coastal areas. The white-browed sparrow weaver’s range extends across most of East Africa. In the south, the range extends from southern Angola and Zambia south through Namibia, Botswana, Zimbabwe, and much of South Africa. 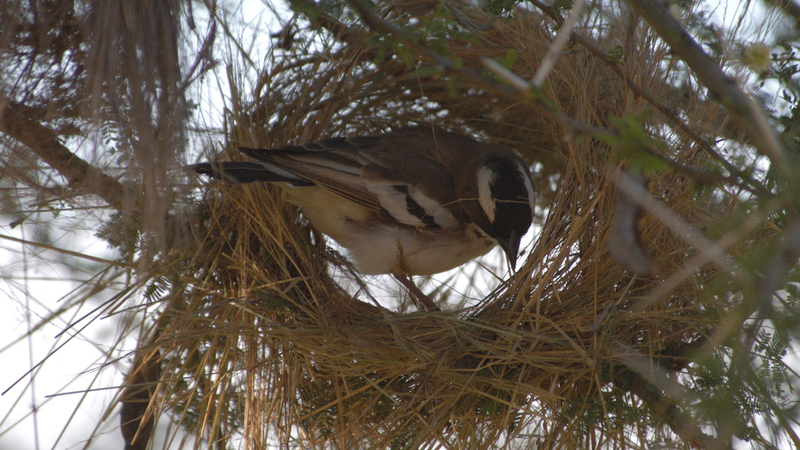 These weaver birds prefer dry acacia areas dotted with large trees. 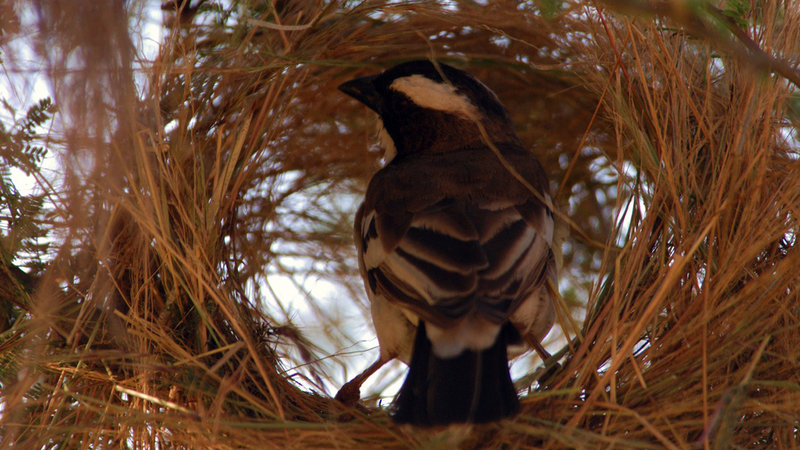 The roosting nests of white-browed sparrow weavers have two openings. One serves as an emergency exit if a predator threatens; the other leads to a breeding chamber where eggs are incubated and chicks are fed.